Outfit your kiddo's bathroom with one of our bath mats, shower curtains, wall decor, bath towels and more, featuring popular children's themes - sea life, zoo animals, space, pirates, mermaids, the jungle, and more! 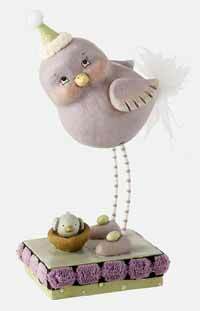 Sweet Treats Bird New Baby Figurine, a Janelle Berryman design, part of her Pumkinseeds Originals line. Reproductions from Janelle's original paperclay creations, these wonderful figurines have truly unique character. You can see the quality in the whimsical forms, detailed painting and antiquing. This is for her New Baby Bird. Despite the name, the tiny hat, lilac bird, and teeny nest and baby bird is adorable enough for any occasion! (Note: this is a retired design, quantities are limited). Stands 5.75 inches tall.